Are you in the market for a new longbow? If so, you should know that the Omp Mountain Man Sierra Longbow offers plenty of pure performance and comfort for a great price. Today, we’d like to share some important information about the features of this model, as well as its pros and cons. Once you’ve learned more about it, you’ll be able to make a wise and informed decision about whether or not it’s right for you. First off, you should know that this longbow is made from hard maple and walnut woods. It comes with a customized finish which is very traditional and beautiful. When you choose this model, you’ll receive a design with transparent limbs which are crafted from Fiberglass. These clear limbs come with tips which are reinforced. Also, each longbow includes a string made from durable Dacron. In addition, the Omp Mountain Man Sierra Longbow is compatible with Fast Flight string. This design measures sixty-eight inches and has a recommended brace height of 6.5.5 inches. This longbow has a rustic appearance which is traditional and very pleasing to the eye. Its gentle curve and fine woods make it a beautiful work of art. As well, it performs wonderfully, since it is crafted with care in order to offer great shooting speed and range. Also, this design is quite comfortable to hold. This longbow comes from a manufacturer with a strong and positive reputation and it’s definitely a smart pick for discerning buyers. Its price range is medium, so it’s affordable for many customers. If you want a budget longbow, the Mountain Man Sierra may be too expensive for you. It’s mid-range in price, but does provide great value for the money due to its excellent materials, construction and features. However, there are cheaper longbows out there in the marketplace. In terms of other cons, there aren’t many. This longbow is powerful enough to be a great choice for any array of hunting types, from hunting deer to hunting elk to hunting turkeys and beyond. If you want power, you’ll find it, even if you have to pay a little more. You’ll find that this longbow offers superior return on investment. This is a five-star longbow. It gets excellent reviews all over the Web, from experts and hunters alike. It’s also great for target practice. Since it’s so beloved by customers and hunting experts, it’s really a great choice. It’s a crowd-pleasing longbow which is loaded with appealing features. Most people who buy it remark on its power. It’s a bow which provides a lot of speed and distance and it offers performance which is super-smooth. As you can see, this bow definitely has a lot to offer. It’s an investment in performance and comfort, as well as lightning-fast speed! As well, it is versatile enough to work for a bunch of hunting styles. If you want a beautiful longbow that you’ll be proud to own, which really performs out of doors, this may just be the design that you’ve been waiting for. Choosing the Omp Mountain Man Sierra Longbow is the key to perfecting your technique and bagging more prey. As well, it’s a good choice for target practice. Find this design at larger online retailers. Make sure that your preferred retailer offers an authentic design. While you’re there, be sure to read customer reviews. You’ll find that they are really glowing. 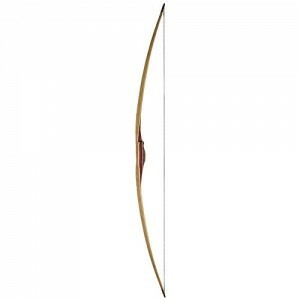 This great longbow also makes a perfect gift for any hunting fan in your life. So, why not order it today?